The Harlans’ life in Coloma was an adventure. Joel did some prospecting and returned one night with $1,600 worth of gold. He neglected to leave a tool to mark his ownership of the hole and found others in his place the next day. Life went on, gold rush or not, as cousin Jake Harlan’s wife, Ann, had their first child on Sept. 9, 1848, at Coloma. Jose Maria Amador went up in June and July of 1848, netting by his account $13,500 from mining and merchandise during one trip, and $10,000 more in another. He and his son took cattle and food to sell and brought 25 Indians with him from his Rancho San Ramon to work for the gold. Their camp came to be called Amador’s and, later, Amador city and county were named for him. The Harlan cousins sold their store in Coloma and returned to San Francisco, where prices had gone up astronomically. Chester Lyman wrote that a 50 square yard, unoccupied lot rose in value from $15 in 1846, to $400 the next year, to $10,000 in 1848. San Francisco’s population went from an estimated 600 in early 1848 to over 20,000 in 1849. Many others who later settled in the San Ramon Valley came from back east because of the gold rush possibilities. Felix Coats settled in Tassajara Valley in 1849. He wrote: Hearing so many tales of the rich mines in California, which caused such wild excitement over the whole country, my father and I, having caught the “Gold Fever,” were anxious to try our luck. R. O. Baldwin and William Meese came from Ohio and mined, eventually discovering Danville in 1852 and planting some of the earliest successful crops in the county that winter. Dan and Andrew Inman left Illinois in 1849 for the gold fields. Andrew began ranching in Green Valley in 1852 and Dan moved here for good in 1858, buying 400 acres which is today Danville’s Old Town. Their first house was listed as a landmark when Alameda County was carved from the original Contra County in 1853. In 1857-1858 they built a new Gothic Revival house, called “El Nido” which still sits at 19251 San Ramon Valley Blvd. in San Ramon. 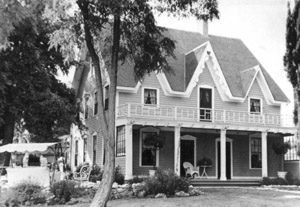 The Harlan’s house and ranch land were well known and their nine children were among the builders of young California. Joel died in 1875 and Minerva in 1915. The Wimmers fade from memory, except for the famous “Wimmer nugget.” Elizabeth Wimmer claimed she had kept the original gold which had been tested in her soap pot. Until the day she died, she wore the gold in a soft buckskin bag around her neck. The gold piece is often displayed at the Bancroft Library, UC Berkeley. J.P. Munro-Fraser in his 1882 History of Contra Costa County called the first Valley pioneers “birds of passage” who had been to the mines, felt the blessings of the “glorious climate of California” and returned to settle. They were part of a huge immigration which raised the population from 14,000 (not counting Indians) in the 1840s to 225,000 by 1852. California ultimately skipped the usual territorial stage and became a state in 1850. Sources: Jacob Harlan’s “California 1846-1848,” J.P. Munro-Fraser’s “History of Contra Costa County, 188,.” Museum archives.